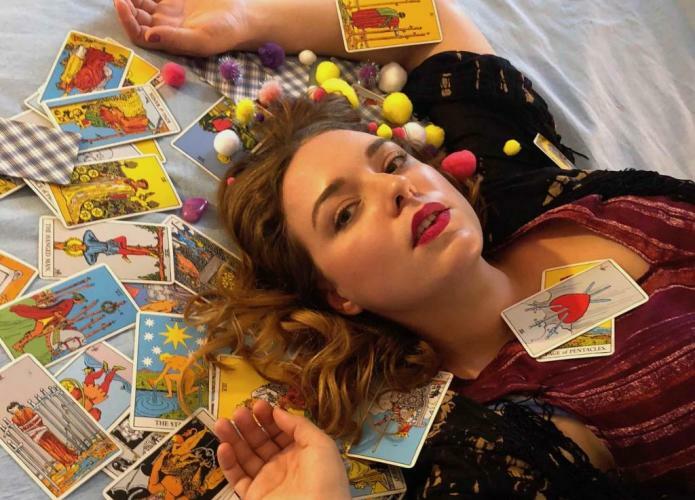 Equal parts 90’s pop music video, slumber party seance, and honest confession, Zodiac Math is an evening of intimate stories scored by anachronistic alt-pop. Joined by an all girl rock band, songwriter/performer Elizabeth May (EMay) invites you into her mystical world. Driven by family folklore of a childhood death curse, EMay explores sexual identity, twin magic, and female-centric stories dripping with pop star bravado. Zodiac Math invites you to laugh, to exhale, and to tear down the patriarchy through dark comedic rituals. This unique theatrical rock concert is brought to you by a team of women who are very familiar with the Strand stage -- having directed, designed, and performed in the 2016 and 2017 productions of The Rocky Horror Show. Starring EMay (“Magenta” from Rocky), Zodiac Math also welcomes back director Lindsey Hope Pearlman, projection designer Ingrid Larson, lighting designer Kate McGee, Lyndsey Anderson (“Narrator”) on lead guitar, and Brittany Parker (“Janet”) on bass and backup vocals. Zodiac Math will also introduce Shannon Sigley to the Strand, whose drumming credits include rock bands Parquet Courts and the Dreebs. Advance tickets available at the link below; by calling (207) 594-0070 (M-F, noon - 4pm); or at the box office when the theater is open for shows. Handling Fee applies to online and phone sales.